When the Old Town became too crowded Edinburgh expanded to the North. The New Town and the city center were designed and constructed in the 18th and 19th centuries. Wide avenues and grand townhouses and buildings in the neo-classical and Georgian style proved to be an elegant solution to overcrowding. This affluent area is home to shops, businesses and expensive houses. The city center is home to the National Gallery of Scotland and the Scottish National Portrait Gallery where you’ll find some of the finest art that Scotland has to offer. Princes Street is the main thoroughfare of the city and the gardens are a great place to enjoy an ice cream in the sunshine. You’ll also find that the world famous Hogmanay celebrations take place here. There are plenty of places to eat in the city center including all of the typical chain restaurants you would expect to find in a major city. There are also plenty of cafes for snacks. If you want a good meal then you’ll find lots of good pub grub on Rose Street and there are some fine restaurants on George Street. Rose Street is a narrow, pedestrianized street behind Princes Street and it is a popular location for groups of drinkers. If you can make it all the way along Rose Street stopping for a drink in each pub along the way then you’ll be ready for bed! There are also a few late night clubs, such as Lulu, on George Street for anyone looking to dance the night away. 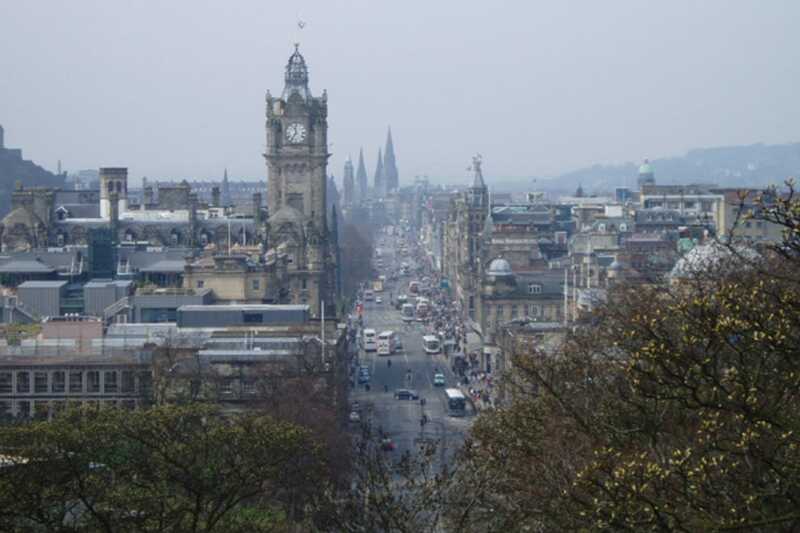 The landmark Balmoral Hotel at the East end of Princes Street is a popular place to stay but you’ll find a few other options in the city center and the New Town including affordable guesthouses and hostels. There are also plenty of holiday apartment lets available if you prefer to cater for yourself. Princes Street may not be the premier shopping destination it once was but you’ll find plenty of options to browse. There are big chain stores offering clothing, books and electronics, there are grand department stores like Jenners and then there are the malls - the St. James Center and Princes Mall.